Join Core Strength & Performance for a workout to benefit the fight against neuroblastoma on November 4th! Wade’s Army is a 501(c)3 non-profit bringing the fight against neuroblastoma and remembering Wade DeBruin’s battle with this deadly pediatric cancer. Wade’s Army’s mission is to bring action to Neuroblastoma, an under-funded, little understood form a pediatric cancer through funding Phase I Clinical Trials and providing direct financial assistance to families in the fight with this deadly disease. 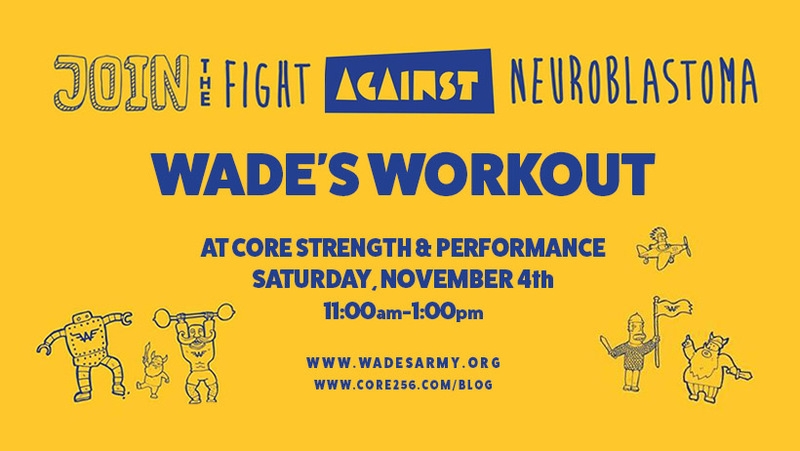 Use your power for good and enlist in Wade’s Army by simply purchasing the official uniform (Shirt) or donate $20 at the event, then on November 4th, we will all wear our Wade’s Army Uniform and hit “Wade’s Workout”! *You can alternate hands as needed during the workout to complete total reps. Scaling options for all fitness level will be provided. Donations are not required to complete the workout. * PRIZES for top male and female finish times as well as free Fitaid drink for all finishers. High Five’s in abundance and excessive photos of highly motivated people will be taken! !